The perfect cake for the perfect day. Individually designed and handcrafted cakes for today's bride. We offer a wide variety of cake flavours including special dietary requirements. If you fancy making your own wedding cake then we are here to help. We sell everything you need to make a beautiful wedding cake or cupcake tower, at a fraction of the cost. We can also offer lots of helpful advice and help. Cakes for all occassions, whether it be a bespoke wedding cake, babies christening cake, or themed birthday cake, your mind can be at ease when you choose to order from Northumberland Cake Cottage. WEDDING CAKES - modern, traditional, contemporary and novelty individually designed to your own specific requirements, available in a wide range of flavours. We have been producing stunning cakes for over 20 years. Visit our website and see the amazing wedding cakes, engagement and anniversary cakes created for our customers. Belinda is a sugar flower specialist. A person who enjoys creating those romantic, floral specimens, for you and your guests to admire. She promises you will not be disappointed! Solihull based family business specialising in Celebration Cakes, Party Cakes, Wedding Cakes, Favours, CupCakes, Bridal Flowers, Wedding Invitations, Chair Covers many more! The Cake Studio designs and creates a wide variety of bespoke cakes for weddings, birthdays, anniversaries and christenings.We also create edible favours, photos and sweet trees. My Custom Cake Toppers are hand made from polymer clay to resemble you on your special day, they last a lifetime so make a great keepsake as well as a personal touch to your cake. Any Occasion Cakes, provide handmade professionaly wedding cakes. Designed Baked and Decorated in our own workshop. No bought in cakes, or cake mixed used. Carterhouse Cupcakes provide cupcakes and other types of cakes which are perfect for your big day. From our signature cocktail cupcakes, speciality cupcakes and canapé cupcakes! Cakes By Robin specialise in providing wedding cakes, corporate cakes, cake pops, cupcakes and more to businesses, birthday parties and a wide range of events across London. Sally Jane Cake Design specialises in creating beautiful & stylish bespoke cakes & cupcakes for your special day. Please contact us to book a consultation or discuss an order. Would you like to impress your guests at your next party? Why not order one of our Cake Buffet Tables? For Wedding, Christening, Anniversary, Christmas and all party events. Beautiful, bespoke cakes, favours & cupcake towers - unique, exquisite & taste divine. Get in touch for a free wedding consultation & cake tasting. Delivery & setup available. Beautiful wedding and celebration cakes for all occasions. Cupcakes, cookies, cake pops. Cupcake decorating parties and tuition. Candy buffets. Many other wedding related services. Beautiful designer cupcakes. We specialise in weddings. Vintage china hire & vintage hen parties. Individually designed wedding cakes with hand made sugar flowers or novelty design with bride & groom marzipan models. For prices and photos please call or email. We provide delicious handmade cakes & cupcakes for weddings. We love to get creative & can come up with something that's as unique & special as the rest of your big day! Bespoke wedding cake designer, from traditional to modern, vintage to funky. Whatever your style we can create a cake that will look stunning at your venue and taste amazing too. 2ChefsPassion have a large selection of wedding cakes and we can design any type of wedding cake from the more traditional wedding cakes to the most elaborate wedding Cakes. At Crumbs & Candy we are focused on providing Retro style Cupcakes and Candy Cups. Flavours available on our website. Cupcake stand hire also available. KO Cakes is a cake making company specialising in wedding cakes.Our food is all made with natural, fresh ingredients that we source locally.Beautiful cakes at low cost prices ! A leading cake maker based in the heart of Lichfield offering stunning cakes for all occasions. Sugar Couture will provide you with the spectacular cake of your dreams, Sugar Couture will create the ideal cake for your big day. We offer a tailored cake design service. Emma Mitchell is a Bespoke Wedding Cake designer, offering a free consultation service to include tasters and a sketch of your dream cake for your special day. Celebration Cakes for any occasion Wedding cakes designed just for you. Award winning Cheshire Based Wedding cake maker. All our wedding cakes are bespoke and made specifically to your requirements. For cheese lovers, as an alternative - or in addition - to the traditional tiered wedding cake, cheese towers made from whole cheeses create a stunning centrepiece. Bespoke wedding cake service. Free bridal consultations by appointment.5* food hygiene, and local authority registered. Moist, mouth-watering and delicious. Cakes should taste as good as they look. Every cake is created with passion, style and is simply irresistible! Contact Broadway Cakes. All cake creations are made from my home in the pretty “chocolate box” village of Micheldever in Hampshire and are delivered to clients in the South of England and up to London. 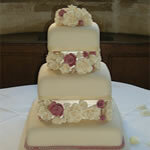 Crendon Cakes is a Buckinghamshire-based, wedding cake designer, providing individual, great tasting cakes. Bespoke wedding & celebration cakes to make you go 'Wow'. All their cakes are made with wicked shots of Jamaican rum or creamy Callebaut chocolate. I am an artist who has been trained by some of the top celebrity and royalty cake maker's in the country. So if it's something unique and with the wow factor you need get in touch! Cake Expectations makes quality cakes and cupcakes for all celebrations. Our full gallery is on our website. We offer a full Wedding Cake service, consultation, sample cake and set-up of your wedding cake at the venue on the day. Stunning Wedding Cakes, all homemade with many delicious flavours eg Choccy Truffle, Lemon Drizzle, Caramel & Butterscotch, Lime & Passionfruit, Baileys! At Home Consultations. Wedding cakes design and decoration. Wedding cake delivery available throughout London and the UK. Please visit us and read our client testimonials. Our wedding cakes will make your celebration unique and special. All occasion cakes, including sugarcraft and wedding cakes. Cupcakes, all at very competitive prices. Home-based cake designer specialising in individually-designed wedding cakes. We listen carefully to our customers so that we can come up with a design which suits their personality and taste - and our cakes taste yummy! Delicious, high quality, handmade cakes for your special occasion, made from locally sourced ingredients. From a large tiered cake to a cascade of cupcakes, we can meet your needs! Amanda Macleod designs and creates bespoke wedding cakes. Every cake is treated as as work of art and the passion and attention to details at Amanda Macleod is second to none. Our wedding cakes designs are creative, exclusive and elegant. Based in Castleford, West Yorkshire, we specialise in creating bespoke cakes for any occasion. We provide fully bespoke wedding cakes to the West Yorkshire area. We offer a variety of fillings and flavours and offer free consultations at a time to suit you. Beautiful and delicious bespoke wedding cakes, baked from finest ingredients and decorated carefully in contemporary style. GemCakes creates stunning wedding cakes that are lovingly created just for you. GemCakes is where your ideas and desires can be brought to life - in cake form at least! Beautiful wedding cakes created with "A taste of glamour"
Wedding and celebration cakes made to your specification,made with the best quality ingredients. A home based cake maker in Reading, Berkshire. Cakes for occasions such as weddings, birthdays, baby showers, engagement partys and any other occasion you can think of! Creators of bespoke wedding cake toppers customised to you and your big day. All our wedding cake toppers are hand made and are unique to your wedding. At The Cake Rooms, we offer a range of cakes of all occasions, from wedding cakes to birthday cakes and much more. Beautiful bespoke wedding cakes. We are quite simply the best! Contact Rachel for your free consultation. Creative, contemporary, deliciously unique. Anna Tyler's designs reflect her youthful approach to cake decoration. Each bespoke cake hand made and delivered to your venue...new shop recently opened, please come and visit! Chic, delicious, bespoke cakes designed to taste as gorgeous as they look. Based in Market Drayton, I can deliver across Shropshire, Cheshire, Staffordshire, and throughout the UK. Rachel is a highly sought after cake designer. Every commission is individually designed to tell the clients story, whilst incorporating Rachel’s own contemporary twist making them beautiful works of sugar art. I am a cake maker in the east midlands.I make Wedding, party and christening cakes. I can set up local wedding cakes at the venue and offer a free consultation with sample cake. Boutique Cakery is a high street wedding cake business, specialising in contemporary wedding cakes using only the finest quality ingredients. Wedding cake maker and designer based in dudley westmidlands. Our packages start from £80 and we can work with any budget. Free consultations and tasting sessions. Bespoke wedding cake makers and decorators specialising in sugarcraft flowers. Catering for clients across Warwickshire, Northamptonshire and Oxfordshire. I design and create bespoke, luxury wedding cakes. All of my designs are individual to each couple and I can cater for dietary requirements. Specialists in bespoke contemporary wedding and celebration cake design. We are a small home run company producing truly stunning cakes with a taste which cannot be matched. ﻿Delicious freshly baked, handmade wedding cupcakes and wedding cakes to order which are guaranteed to impress your family and friends. Let us create a dream into reality! Based in Frodsham Cheshire, we have over 100 years experience in baking and decorating Wedding Cakes, so you can be sure of the highest quality from Crowthers Cake Studio. Cakeland supply stunning bespoke wedding cakes thoughout the west midlands. we supply homemade wedding and celebration cakes, made from the very finest of ingredients to your very own requirements. we will deliver and set up your special cakes at your wedding reception for you. Bespoke wedding cakes tailored to your theme, bespoke wedding cake solutions such as cupcakes and cake shooters with cake stands. Angela's mission at The Little Pink Wedding Shop is ensuring you get the right wedding cake and wedding flowers for your most precious moment, at the right price, is paramount. Natalies Cakes and Toppers is a family cake making business based in Buckingham. We offer a bespoke cake service with a personal touch. Specialising in beautiful, floral and vintage designs, we use only the finest ingredients to make a delicious and stunning centrepiece for the most special day of your life. Premium macarons handmade in London and delivered throughout mainland UK. We supply Macaron Favours, Personalised Macarons and Macaron Wedding Cakes (Macaron Towers). Cocoa & Whey Cakes design and make beautiful, handcrafted wedding cakes and favours - both sweet and savoury - for clients across Hampshire and the South East of England. Cakes by Robin specialise in all types of wedding cakes from bespoke creations to novelty and budget wedding cakes. We can also provide cutom dessert tables, cupcakes, etc. Pie& create bespoke Wedding Pie - a savoury alternative/accompaniment to the wedding cake. Tiered Pies complete with Pastry Decorations including a Bride and Groom topper, or Individual Pies which can be used as favours. Beez Cakes create elegant, delicious, bespoke cakes and cupcakes for your wedding or special occasion. We guarantee a professional service from beginning to the happy ending. Very fairly priced wedding cakes and cupcake towers, cold buffets. Beautiful cakes at a great price. Specialising in cakes for all occasions, Located in West Derby, Liverpool. All cakes are freshly home baked to order. My cakes not only look fabulous but taste delightful too. Founded by cake designer Charlotte Watson, Charlotte Emily Cake Design creates beautiful bespoke wedding and celebration cakes from our kitchen in Berkhamsted, Hertfordshire. We are a home based cakery which makes wedding cakes, cupcakes, celebration cakes and cake-pops. We look forward to hearing from you for a free no obligation quote. Unique wedding cake & creations team. Providing wedding accessories in an online shop or rental service. Lincy strive to create a personalised service for an affordable price. Cheese wedding cakes created using whole artisan cheeses. Individually designed to your brief and budget our wedding cheese cakes make the ideal choice for your special day creating a wonderful centre-piece. Janice Hull is a professional wedding cake designer and creator, from elegant and romantic wedding cake to unusual and quirky wedding cakes. Specialising in wedding cakes, and cupcakes. Award winning cake shop and online business based in Huyton-with-Roby, Liverpool. We can create any cake imaginable, just let us know what it is that you want and your budget. Fantastic wedding cakes to suit all tastes and budgets. Free delivery in Surrey area. Hand crafted ceramic cake toppers made to match you on your special day. Pets, hobbies, uniforms and more can be included. Available to be delivered within the UK. AJS Cakes is based in south west Surrey and offers a personal service to design and create bespoke wedding and celebration cakes, tailored to your exact sepcifications. Award winning wedding cake designer based in Bristol. Cakes baked fresh to order using best ingredients. Personalised and hand crafted with passion and attention to detail. RAINBOW SUGARCRAFT specialise in making exquisite Wedding Cakes, decadent chocolate creations and towering croquembouches with a real ‘WOW! Factor! Every Wedding Cake is an exclusive design the only lmiits being your own imagination. Sweet and Elegant specialises in creating beautiful & stylish bespoke cakes for your special day. Please contact us to book a consultation or discuss your requirements. Based in Hebburn, Tyne and Wear, I cover all of the North East including North and South Tyneside, Sunderland, Washington, Durham areas, Northumberland and Teesside. Award winning wedding cake artist based in Paulton on the outskirts of Bath and Bristol. Beautiful bespoke cakes tailored to your requirements and needs. www.temptingcake.com offers beautiful designer tiered wedding cakes, cupcakes and hand iced cookies to discerning brides in London and surrounding counties. I make all kinds of celebration cakes from birthday to weddings and cupcakes all made to order however you choose.Get in touch by email or even via whats app for a quote. Beautiful Wedding Cakes Handmade in Aylesbury. Delivered and set up at your chosen venue. Delicious cakes. Where designing beautiful Wedding Cakes, Cupcakes, Elegant Favours and Scrumptious Wedding Cookies is our favourite pastime. All our sugary cakes and sugar decorations are handmade. At Keiron George, we specialise in luxury wedding and celebration cakes. Simply Precious Cakes specialise in creating beautiful, elegant and delicious Wedding Cakes and Cupcakes. We work closely with our clients, your style, your colour , your budget. Annes Bakery is an Leading Online Bakery specialising in Gluten Free and Wheat Decorated Cakes, Wedding Cakes, Indian Cakes, favours and all catering requirements. We are delighted to offer you beautiful wedding cakes made to your requirements. Do you want to make your own fruit cake but cant decorate it, let us (subject to seeing cake). Or we have everything for you to make your own. Each cake is unique and produced especially for you,whether it is a comtempoary, modern or traditional design. Providing intricately decorated wedding cakes for your special day. We offer our shoppers a professional standard of service and care and we have very high standards in terms of our shop’s décor and our stock. Wedding Cake design with a unique flair. We use our artistic background, passion and attention to detail to create the perfect Wedding Cake for you. Free consultations available. We offer a range of cake decorating tools online at competitive prices. From cake toppers to airbrushing cake sets, we have everything you will need to create the perfect cakes. Classic yet modern Wedding Cake designs with just the right touch of vintage to make it so so chic! Beautiful, and delicious for the most discerning palette. Privater Gitarrenunterricht in Hamburg mit Savio Rego - Hausbesuche möglich. Specialising in Wedding Cakes, creating unique designs, personal to you, from Contemporary, Vintage, Art Deco, Retro to Asian influence. Cake Rental & Wedding Planning services. One of the North West’s premier designers of luxury wedding cakes. All our cakes are completely bespoke, tailored to fit in perfectly with your your style, theme & colour pallet. Top Nosh Cakes specialize in designing all styles of wedding cakes,traditional or modern our cakes are exclusive, We produce the most original and unique wedding cakes imaginable. 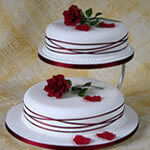 At 1st Choice Cakes our stunning range of cakes cover the perfect cake for you for wedding occasion. Delicious fruit cakes, fantastic chocolate cakes and elegant spongecakes in traditional or contemporary styles. Eggless and gluten free cakes are an option,and cup cakes. Cake stand hire, and dummy cake hire available. Bespoke wedding cakes. Beautiful cakes designed to your ideas. 100% dedication to your special day. Personalised bride & groom wedding cake toppers, created to look like you on your wedding day, various styles & prices. Serendipity Cakes specialise in belgian chocolate wedding cakes, offering a range of unique and contemporary designs. Free design service with professional cake designer to tailor make your own original wedding cake. We can provide Modern and Traditional cakes in various shapes and sizes. Bespoke Wedding and Celebration Cakes, Cupcakes, Cookies and cake toppers. Belgian Chocolate Cakes our speciality. Visit our online shop for all your cake decorating essentials. We create bespoke wedding cakes, cupcakes, and favours - macarons, marshmallow, iced biscuits. Plus offer a consultation to discuss your cake ideas and for you to sample flavours. We are a Wiltshire based Cake Specialist for Weddings, events and celebrations. Isabella Boo Cakes specialise in handmade bespoke wedding cakes, thourought essex and suffolk. Choose from a standard design or create your very own wedding cake style. Crumbs and Doilies provides beautiful cupcakes for weddings, parties and events. Delivery, set up, stand hire, topcakes and a host of other bespoke options are available. Bespoke wedding cakes. Your style, your colours, your budget. We also offer cupcakes, cupcake bouquets and towers and mini cupcakes. Vegan, gluten free and lactose free options. Little Velvet Cakes are always lovingly home baked then decorated in show-stopping glory! I provide a personal and professional service in Cheshire and South Manchester. Using the finest ingredients and with the utmost care and attention to detail, take the worry away from your cake order and rely on me to help make your dream cake a reality. Designer and maker of bespoke wedding cakes and favours. Delicious and beautiful cakes and dessert tables, please call to arrange a consultation. We design and make bespoke wedding cakes that taste as good as they look. We also provide wedding cupcakes, cake pops, cookies and macarons. Delivery and set-up available. At Cocoa & Whey Cakes we specialise in beautiful, stylish cakes for weddings, corporate events and special occasions, providing a delicious and striking centrepiece for your event. I am a bespoke cake designer who will work with you to create the cake of your dreams. Using only the finest ingredients and the utmost care and attention to detail. Working closely with every client from initial design through to delivery. Cake Artistry alongside knowledge, enthusiasm and 10 years of experience creating your perfect Cake! Ely has specialised in wedding cakes for over 10 yrs. From Traditional to Contemporary, Ely can produce a stunning cake for your big day. Free delivery/set-up in Herts/Beds/Bucks. Classic and contemporary designs handmade by award winning cake maker. Beautiful handcrafted sugar flowers and toppers. Range of delicious flavours. Friendly consultations in your home. Free delivery and set up in Herts. We create bespoke Wedding cakes to match your theme and make your dreams come true. In addition we make favours to compliment your cake. We make delicious Wedding Cakes and Rum Wedding cakes decorated to your specification. Our delicious moist cakes will leave wonderful memories with you and your guests for years. I run a small home run business and can create your dream wedding cake at a reasonable price. Inbox me for details or add me as a friend on facebook for up to date images. Based in Shropshire, we are a bespoke cake company that specialises in all manner of Wedding Cakes to make your day special. Samples provided free of charge. Contemporary Wedding Cake Designers in Cardiff, Wales. Individual designer wedding cakes, croquembouche and chocolate sculptures from an award-winning Italian Patissier. Provides cupcake bouquets as a delicious alternative to the traditional wedding cake; they come in bouquets of 7, 12 or 19 cupcakes and a small bouquet starts at £20. Freshly baked to order. All made with free range eggs or egg-less. I can bake sponge cakes in a variety of colours, flavours and sizes. I cater for special diets ie gluten free. Are you looking for a bespoke wedding cake, handcrafted and exclusive to you? When you order from Especially Delicious, you are guaranteed to receive an original and delicious creation made especially for you. We can make a 3 Tier sponge Wedding Cake from only £80. With hundreds of cakes to choose from - Cupcake towers, Novelty designs, Classic 3/4/5 Tier cakes.... The list is endless. Creators of beautiful and delicious wedding cakes. Professionally trained we provide excellent quality and an attentive service covering Essex and the surrounding areas. We will hand craft your drewam wedding cake, while catering for customers with intolerances, ensuring that everyone can enjoy an exquisite slice of your stunning wedding cake. Pipedreams Cake Design offers over 700 designs in out bridal cake portfolios and over 90 styles on display in our showroom. You can choose from traditional, modern, novelty and chocolate to create your own bespoke design. My exquisite and distinctive wedding cakes are all produced to a unique design to meet your specifications, whether contemporary and modern or classical and elegant. The Wedding Cake business is expanding and now provides wedding flowers, wedding gifts, venue dressing. Angela and her staff look forward to exceeding your expectations. Provides bespoke wedding cakes to the Glasgow and lanarkshire area. Looking for something special? From hand-decorated cupcakes to an exquisite multi-tiered bespoke wedding cake, Occasion Cakes offers luxury tailor-made cakes for any occasion. Ann's Sugarcraft Heaven: Beautifully hand crafted sugar flowers and sprays for all occasions,Wedding cakes in particular can cost hundreds of pounds, so keep to a sensible budget without loosing wedding chic. We are a local family run bakery in the heart of Kent. Specialising in all things sweet and yummy for corporate and private clients.Offering our traditional Afternoon Tea package. Hand crafted ceramic cake toppers made to match you on your special day. Uniforms, hobbies, pets and more an be included. A centre piece from your special day to treasure forever. Returned to hometown of Wolverhampton,active in the wedding cake industry for over 20 years. Regular contributor to SA bridal magazines & contributions in UK publications. MY BAKER is UK's first online cake concierge.Place an enquiry and receive a variety of quotes and ideas from our curated network of wedding cake specialists. Beautiful and delicious bespoke wedding cakes and favours. From traditional tiers to unique one off designs, we offer wedding cakes for all tastes & budgets. Offering a personal, bespoke service from Robert Watson at Orange Rabbit Cakes.